Providing fringe benefits goes hand-in-hand with the task of retaining good and loyal employees as well as attracting new talent for your business. However, the types of benefits provided can sometimes relieve the compliance headache. Now that we have entered into the new fringe benefits tax year (which began on April 1), business owners are reminded that not all of the benefits that can be provided to employees attract FBT. For example, there are minor benefits (valued at less than $300 and that are provided on an irregular and infrequent basis) that may be exempt from FBT. An example of a minor benefit that escapes FBT is a gift or meal provided by the boss at Christmas time. But there are also other benefits that can be provided to your employees that are specifically exempted from fringe benefits tax. From April 1, 2016 small business owners can now provide their employees with multiple work-related electronic devices without incurring FBT liabilities. This applies even if the devices have similar functions. Items purchased before April 1, 2016, but supplied to the employee after this date, are eligible for the exemption. Multiple devices bought and given to the employee before April 1, 2016, (that is, during the just-past FBT year) are not eligible. 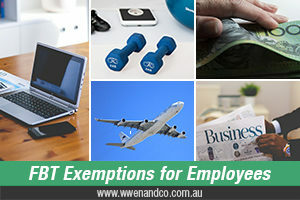 In these cases, the exemption only applies to one item for that FBT year. Note that eligible small businesses must have aggregated annual turnover of less than $2 million. Those businesses that aren’t eligible must still follow the existing rules (that is, one device per year). Where a business has arranged for a program to be made available to its employees to learn how to eat better and exercise properly, for the purpose of assisting them with managing their health, fitness and stress, and the employer allocates time during the working day, the cost of this benefit is FBT free. Please note if you are an employer that the ATO requires you to have an objective, plan or policy in place to improve or maintain the quality of employee performance. Genuine safety awards made to an employee in an FBT year up to a total value of $200 are exempt, but once over $200 the whole amount is subject to FBT. Long service awards for service of more than 15 years is usually FBT exempt (for example, an item such as a watch) but there is a value threshold, which is $1,000 for 15 years of service and $100 for each additional year. If the employer provides another benefit following additional years of service, the benefit is exempt if it is no more than $100 for each year of service in excess of those years for which a benefit was previously provided. If in excess of either the $1,000 or $100 limits, no exemption applies. The ATO accepts that employee contributions are usually not counted towards the value of the benefit. Further, a separate benefit provided by work colleagues in an arm’s length situation would not be subject to FBT. There is no FBT on the cost of education for that staff member’s children (subject to conditions). Where an employee from overseas is working for an Australian business (in Australia) and is a temporary resident at the time, the making of a contribution to a foreign superannuation fund for the purpose of providing superannuation benefits escapes FBT liability. This is much like superannuation guarantee payments made for a resident. newspapers and periodicals provided to employees for business purposes. Need specific advice for your business’s FBT obligations and exemptions? Call the Epping office of accountants, W Wen And Co, on (02) 9871 3429.